The gray fox is a close cousin of the more common red fox. But unlike the red fox, the gray fox can climb trees and prefers mature hardwood forest and woodlot habitats. General description: A medium-sized canid (member of the dog family) that resembles a red fox in shape, but is gray with a black tip on the tail. Length: 35 to 40 inches long, including the 12 to 15 inch long bushy tail. Weight: Adults weigh from eight to 14 pounds. Color: Grayish, with a distinct black stripe on top of the back and tail. The underfur, belly, and feet are a yellow buff. Breeding occurs in late winter, and gestation (time required for the young to develop) is about two months. Litter size averages four, and the young stay with their mother until autumn. Red and gray fox do not cross-breed in the wild. Gray fox eat a variety of small mammals but have a preference for cottontail rabbits. Other foods are small birds and insects. Grey fox can climb most trees, and sometimes they catch prey there. New born fawns are also a favored prey item. Gray fox compete with red fox for food, but their main predator is probably the coyote. In some areas of Minnesota such as the southeast, coyotes have replaced gray fox as the most common mid-sized predator. Gray fox inhabit the woodlands from southeastern to northwestern Minnesota, but are uncommon in the southwestern farmlands and the northeastern forests. Only recently have gray fox occurred in north central Minnesota, perhaps due to climate change and a growing population of cottontail rabbits. 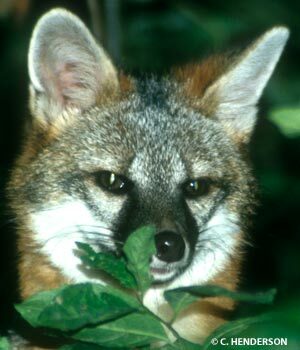 The gray fox is classed as a furbearer, and is managed with a regulated hunting and trapping season each year. Only a few thousand are taken for fur annually. The gray fox is the only member of the dog family that can climb trees, and does so both to catch prey and escape predators. Climate change may be helping the gray fox extend its range northward in Minnesota.